In order to fully understand the feat that Cindy Aguilar-Castañeda pulled off, a little bit of background is in order. 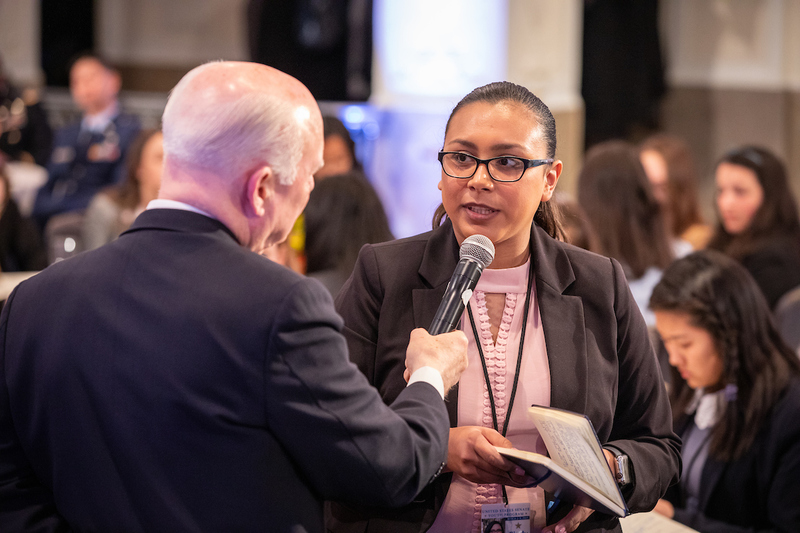 In early March, Cindy, 18, was one of two young Californians to represent the Golden State in the United States Senate Youth Program, which brings 104 young people to Washington D.C. to see first hand how the federal government works. Aguilar-Castañeda was born in Salinas and raised in Gonzales, population 8,187 and with a median household income of $41,582. Compare that to her fellow California youth senator Lauren Kong from Rancho Palos Verdes, population 41,000 and with a median household income of $119,000. In fact, except for Cindy, all California finalists for this year’s Youth Senators program hail from either the greater Los Angeles region, like Kong, or Orange County. And while money can’t buy intelligence or eagerness, it goes a long way to provide young people with opportunities that will allow them to develop poise and confidence. Opportunities in rural Monterey County are not as plentiful as they are in L.A. or Anaheim. But what Gonzales may lack in opportunities has more than been made up by local civic leaders championing their youth. It all began about five years ago when a group of high school students made a presentation to the City Council about the barriers they were facing, such as lack of recreation and bullying. Thus the Gonzales Youth Commission was formed. When Aguilar became a freshman in 2015, she decided to join it as a way to show her mother how government works. Joining the youth council “was a way to show my mom, ‘Hey, I can translate things for you. If you have a complaint, I can advocate for you.’ It turned into my own passion and my own vision,” she said. Gonzales is the only city in Monterey County with youth representation during city council meetings, a practice they began about five years ago. The young commissioners, who represent a body of 12 members, report to the council about issues happening in the Gonzales Unified School District. In turn, they report to their fellow commissioners about issues affecting the city. On the commission, Aguilar’s main role is to train other youth to be advocates for the change they want to see — after she herself was trained to develop those skills. She’s taught her peers how to deal with adversity, how to have healthy conversations, and how to collaborate with one another. Last summer, she was able to present those skills to the Gonzales Public Works Department — an experience like no other. “With the youth council, they’re younger than me. These were older persons and mostly men. It was difficult navigating the audience, but it was never like they were not listening. They were going with it, and it goes to show how Gonzales truly cares about young people,” Aguilar said. You can pack a lot into four years, and that’s exactly what Aguilar’s done during her tenure at the Youth Commission. She’s helped with a toy drive and applied for grants to buy the toys. She launched a solo project called the “Kindness Campaign” to talk about, well, kindness and to speak against bullying. She’s advocating for the construction of a Teen Innovation Center in Gonzales. But she’s most proud of the work she’s done with the Senior Swarm, an initiative to encourage her fellow seniors be ready for college and careers, with workshops on how to choose college, how to navigate financial aid and similar topics. “The idea is that the community swarms around our seniors,” she said. On top of her extra-curricular activities, Aguilar carried nine units at Hartnell College last semester as a way to make up for lack of AP classes in her high school. This year, her load is lighter with only two classes — English and statistics. She has been accepted at UC Berkeley, where she plans to study political science. Only two students per state, the District of Columbia and the Department of Defense Education Activity are chosen to participate in the United States Senate Youth Programs, established in 1962 by U.S. Senate Resolution. In California, participants are chosen by the California Board of Education and the State Superintendent of Instruction. All expenses for the trip are covered by a grant from the Hearst Foundation, plus participants receive a $10,000 scholarship for their studies. During her week in Washington D.C., Aguilar and her 103 fellow young senators met Supreme Court Chief Justice John Roberts, President Donald Trump, Housing and Urban Development Secretary Ben Carson, Secretary of State Mike Pompeo, ABC News’ chief global affairs correspondent Martha Raddatz, among many others. They also had a tour of the Pentagon and a meet and greet with David L. Norquist, who is performing the duties of deputy secretary of defense, and Vice Chairman of the Joint Chiefs of Staff Air Force Gen. Paul J. Selva. Now, more than ever, she said she’s hungry to change the world. “There’s no obstacle for her,” Orozco said. “When she sets her mind on doing something, she accomplishes her goals. She’s passionate about social justice and being that voice.